Saturday we laid our Big Oak to rest with quite the party! Friends and family gathered to watch Beaver Tree Service take down the tree in a process that moved astonishingly fast. 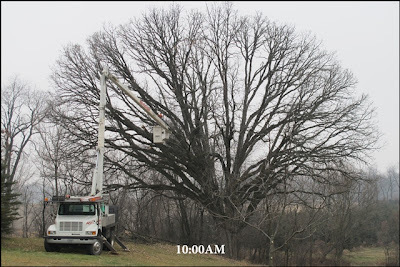 It took nearly 200 years to grow to that size, yet only a matter of hours to come down. The crew turned off their equipment around noon and everyone went inside to warm up and have lunch - another delicious meal by Joel. With our tummies full, it was time for the final good bye. 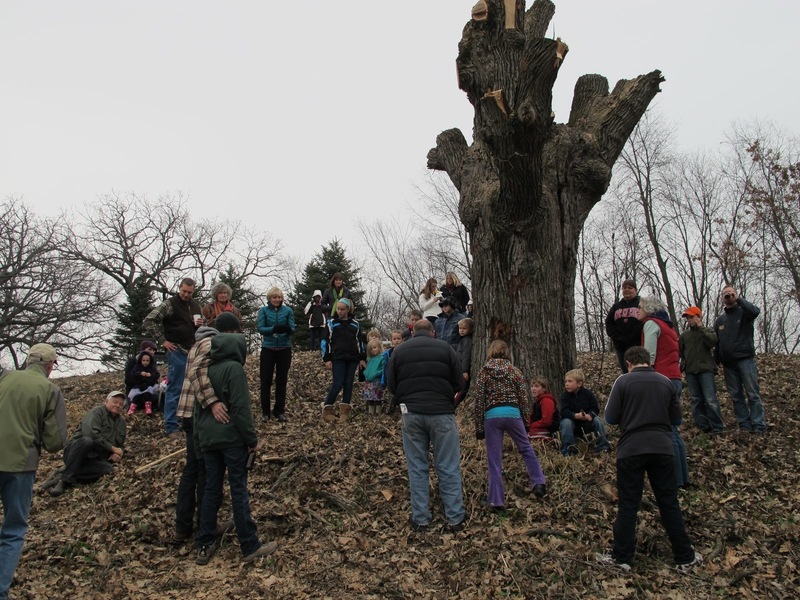 We all gathered around the oak, and Buddy from Aldo Leopold Foundation led the group in reading "The Good Oak" and "Bur Oak" from Leopold's A Sand County Almanac. With the eulogy complete, the mourners took turns with the axe, getting a feel for just how much elbow grease would be required to manually take down a tree of that size. 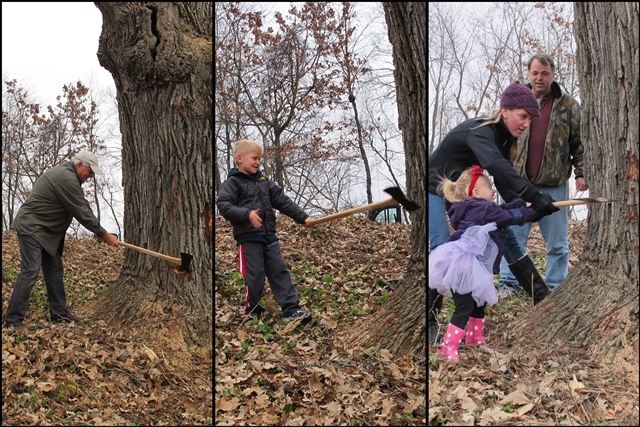 After sawyers big and small had their turns with the axe, it was time to step back again and let the pros do the rest. Mike started by cutting out a notch on one side of the trunk, then coming across towards the notch from the other side. 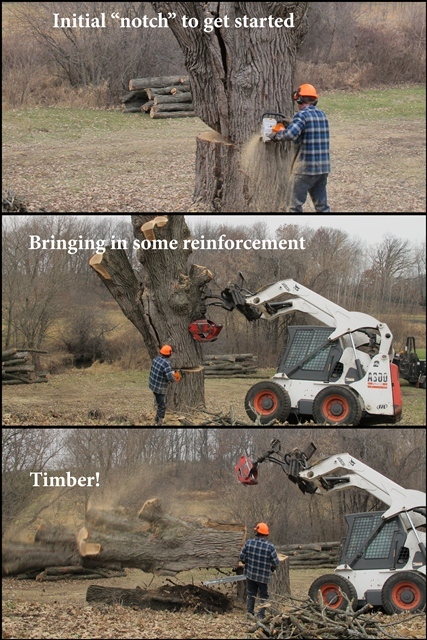 That worked out well until the saw began to get stuck, so he called in the Bobcat for some reinforcement. 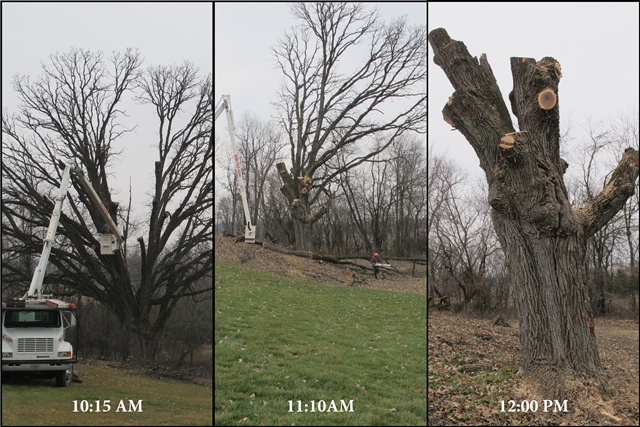 From there, it was only a matter of moments before what was left of our Big Oak came crashing down. Thanks everyone for coming out on Saturday! Check out our Facebook page for more photos from the event. Nice post, Great work done by tree service company.They did this work very soon.Thanks for sharing this information. Superb Post,I have spent a lot of time to gain effective info,I liked it very much,Thanks for sharing this information.